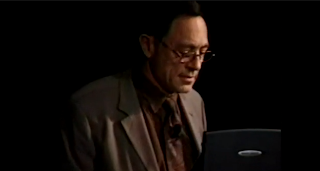 Harvard professor Dr. John Mack gave a two-hour long presentation at the International UFO Congress in 2003, the title of his talk was Transcending the Dualistic Mind. This is the audio lifted from a 12-part YouTube video of this presentation. Highly recommended. Two listening options below. Thank you so much for uploading this audio, Mike. There's a lot of things Dr. Mack said that would be of great value for escaping the current materialistic paradigm we're stuck with --if someone bothered to pay attention. I really think he was right on the money with his assertion that we need to come up with some sort of 'Science of human experience.' Not just for people who claim the abduction experience, but also for people who encounter the machine elves under the influence of DMT, or people who describe the tunnel of light during near-death experiences. I recently had an e-mail discussion with a young friend who describes himself as an open-minded atheist --open-minded in the sense that although he could accept the existence of an after-life, that does not necessarily preclude the existence of a deity. I ask him: "what sort of experience would yo require in order to change your lack of belief in a God?" He didn't really know how to answer. He told me that even if he had some sort of dream or visionary experience, akin to St. Peter on the way to Damascus, that such a thing wouldn't be enough to convince him, since he would keep questioning whether it was all a hallucination produced by his own mind. From his perspective, whatever cannot be scientifically validated, must not be accepted as truth. Such an interesting attitude, especially when you think about the 'non-interventionist approach' Mack ascribed to God on this very presentation. Agreed. Too bad the echo chamber is filled with noise, fear, Miley, Honey BooBoo, and pharma ads.